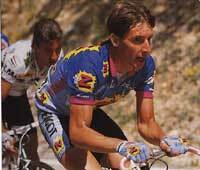 robert millar is hardly the most imposing of figures, and compared to riders like malcolm elliot and joey mcloughlin, his public profile even among the sports press isn't going to make maradona lose any sleep. yet, compared to any other british cyclist - ever - millar is one of the best. robert millar is not, unlike sean kelly or stephen roche, one of the riders that a journalist will make a bee-line to either before or after a race. the 30 year old glaswegian hasn't got a reputation for being a rent-a-quote rider. the usual banal questions fired at riders in the helter-skelter of a race finish are unlikely to be given more respect than they deserve by millar. in a sense there is no reason why millar - or any other rider who has just ridden to the limits of their ability for the previous five hours, should dignify idiotic questions with a coherent answer, but for some it is part of the job. if roche, kelly, earley and the rest manage to hide their disgust and respond, then for others - laurent fignon for example - there is no excuse. some riders play the pr game a lot better than others. that attitude is fine for some, but there is little doubt that millar has suffered because of his 'difficult' reputation. even in france, his adopted home for the past decade, he remains 'an enigma' although naturally he speaks the language fluently. in scotland, glasgow club riders still tell how the young millar always kept himself to himself, even on winter club runs. if there was a fire to be built for the soup cans, millar would build his own. it is hardly surprising that a reserved young man would remain anything other than circumspect in his dealings with the media. but millar is a professional of ten years standing and is now in his eleventh, riding his eighth tour de france. what is it about the british media that sticks in his throat? i put that question to millar, who had a copy of the french sports daily l'equipe in front of him. after a prolonged sigh and a rueful expression he replied, " how can i put it politely?...there's just not the same standard of reporting in britain as there is here. you get a lot of interest before the tour de france when you're not really wanting to answer a load of questions which are all the same anyway. reporters phone you up to ask questions that they already know the answer to, and anyway they want to write. sometimes someone who knows nothing about cycling will ask me what i do for a job when i'm not cycling, and that just cracks me up." while most sportsmen seem content to play the media game. millar's spiky character reveals a side of him that was instrumental in his getting to where he is today. all the top riders are ruthless, and some, like the irishmen roche and kelly - are able to switch from one mode to the other. being a continental pro is a tough way to make a living, and although a surprisingly large number of brits have tried it, few (barry hoban, tom simpson, sean yates and millar) have even come close to making the big time. you quickly find out if you have got what it takes to be a pro. millar, like yates, roche, phil anderson and allan peiper, road for the paris amateur club the acbb for two seasons before turning pro for peugeot in 1980. he has been instrumental in helping one or two other scottish riders to get a place on one of the best teams in france. it's hard to get in but it's even harder to survive. "a lot of guys go expecting paradise, but it's like going to vietnam or something. you go at 19 expecting glamour and you get there and there isn't any. they go over and they think that because they are with a big club there will be no problems, but you've got to fall on your feet. it's like one day you're a schoolboy and next day you're supposed to be a grown up. even if you are a full-time bike rider, at home you are still just playing at it, because you can still go home to your mum and dad every night. leaving home means that you've got to be more independent, and if you can't cope with being away from home for months at a time, then you are in the wrong job." so all things considered, it takes not only a gifted bike rider to make the grade, but also the sort of character who can harden himself to the lifestyle. someone who can deal with the loneliness of being a long distance cyclist, so to speak. there may be some residual glamour attached to the life with all the travelling and the hotels. however, the pleasure soon wears thin when you are living out of a suitcase and racing in the sleet, snow and rain of the belgian spring. "it might look nice but it ain't," states millar. "it's not something you take lightly either - it's your job you know, it's just like being an assembly line worker or a postman. i feel the same about it now as i did when i started and thee's nothing nice about it. the satisfaction comes from doing your job well, in your own terms. not in terms of your peers or the manager or the team, only on your won terms. if you aren't happy with yourself or satisfied with what you are doing, the way you were riding, it doesn't matter what everyone else thinks. it's ok for other people to be pleased with you, but you'll still be lying in bed at night thinking about it." here agian millar shows another side of homself that is perfectly in character, where determination, individualism, self-interest and a soupcon of selfishness meet. millar knows what he is capable of and so as far as he is concerned, should everyone else. english may increasingly be the language of the future, but britain, alas, isn't going to produce a steady stream of top quality amateur or professional riders until such times aas the various cycling federations get their act together. millar has watched the ebb and flow of the sport over the past 15 years. "in general, the problem is that people want their athletes to do well, but they don;t want to give them any money. until britain wakes up to the fact that the sport isn't amateur and the athletes aren't going to succeed, there will always be the gifted individuals, but overall success depends on government funding of the sport. "i come back to ride these televised criteriums to try to help generate some interest, but until the pros here get a decent injection of cash then they can forget it. ever since i've been a pro they have been saying that the uk pro scene is going to get bigger and better, but it never has, it just goes up and down." and as for millar himself, what does his future hold? "i reckon that i'll keep going for another five years, if i can maintain my present salary, but it all depends on the races. if the guys keep riding like they are now, then i'll be alright." so there we have it. 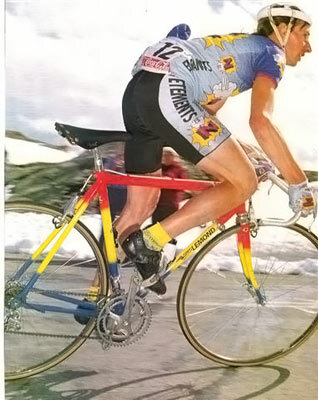 robert millar, winner of king of the mountain titles in the tours of france, italy, spain and romandie; winner of the tour of britain, catalonia and the dauphine libere; and a stage winner in all the national tours. in the 1990 tour de france? the king of the mountains jersey and a pyreneean stage win are well within his grasp. not bad for an outsider. if you've arrived at this page from a search link, and you'd like to see thewashingmachinepost in all its glory, click here. you will still be able to access all the robert millar pages from the navigation.